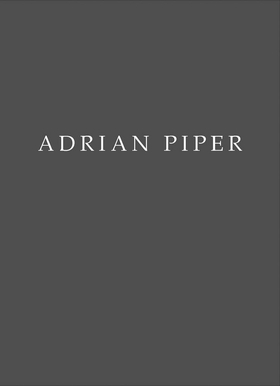 Paperback, 7.25 x 10 in. / 92 pgs / illustrated throughout. Edited with text by Begum Yasar. Text by Aliza Shvarts. Marking Lévy Gorvy’s first solo exhibition with acclaimed conceptual artist and philosopher Adrian Piper (born 1948), this focused presentation includes examples from The Mythic Being series (1973–75), It’s Just Art (1980) and Here, an installation work conceived in 2008 and realized for the first time at the gallery. 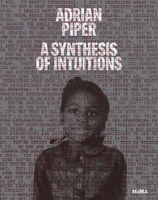 Together, these three bodies of work delve into interrelated themes Piper has explored throughout her career—the intersubjective formation of self, identity, race and gender; racism, sexism, xenophobia and competing conceptions of political responsibility. 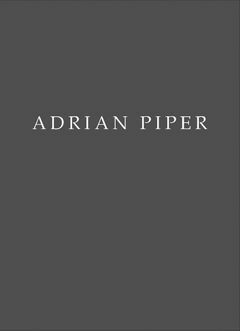 The book includes an essay by Begum Yasar and Aliza Shvarts, “Alienation, Too, Has Its Uses,” which thinks through Piper’s writings and works to discuss contemporary manifestations of xenophobia and racism. Also included are a biography of the artist and color plates of the works. FORMAT: Pbk, 7.25 x 10 in. / 92 pgs / illustrated throughout.